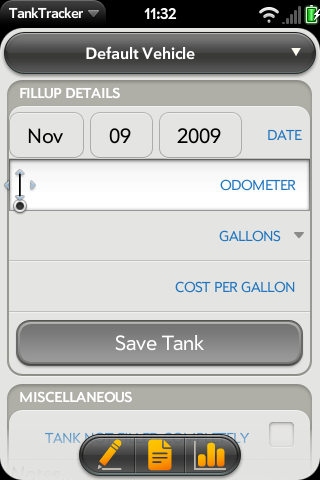 Tank Tracker allows you to keep track of the fuel efficiency of multiple vehicles. Just enter the date, odometer reading, how much fuel you purchased and how much you paid per gallon and Tank Tracker will show you several different statistics. It also provides charts of Mileage, Distance Driven and Fuel Costs over time. Keep track of the last time your oil was changed and the last time you filled up with high octane fuel with the new note system. The app also features import/export functionality so you can both add existing data to the application and email yourself a backup of the records you have on the phone. Add miscellaneous notes to keep track of maintenance and other items. Track expense of maintenance items.